There was a time when scientists regarded the universe as the handiwork of God. But most modern scientists operate on the assumption that God is a myth, that the universe is an entity caused and ruled by chance. Nonsense, says Dr. R.C. 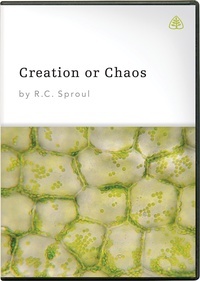 Sproul in Creation or Chaos: Modern Science and the Existence of God. The relationship between science and faith is controversial — even among Christians. This series addresses the most fundamental issue in the dispute. By showing the logical absurdity of the chaos theory of the universe and the supreme rationality of creation, Creation or Chaos can help you take a confident and credible stand for Christ. Creation isn't just a Christian principle. The major religions of the world at least agree that God created the universe. R.C. Sproul expands on this notion and illustrates how a departure from the deductive side of scientific inquiry has introduced irrational and illogical inferences of the origin of our universe. He examines the "Grand Myth", as he names it, of Chance. This is a must-have series for any Christian, as it displays a completely logical and rational explanation for the creation of the universe by an omni-present God by uncovering the fallacy of Chance. This series is fantastic! It helped me to clearly understand that in order for there to be anything in existence it requires first a pre-existent creator with the power to create and how &quot;something from nothing&quot; theories of creation are completely illogical. I've listened to this series 20+ times and it never gets old. It helps me defend my faith.